Mfangano Island now has a 1Mbps Internet connection. For those of you reading this over a high-speed cable, DSL, or fiber connection in a developed country this may not sound terribly impressive. However, when you consider the four major challenges we had to overcome to bring this meg of data to a remote island nestled at the mouth of Winam Gulf in Lake Victoria, you might think again as to the level of this accomplishment:. I am Andris Bjornson, Inveneo’s CTO and I first met the staff of the small Kenyan NGO Organic Health Response (OHR) two years ago when OHR asked Inveneo’s Eric Blantz to have Inveneo come to Mfangano Island to conduct a survey to assess creative options for bringing Internet to the island. When OHR’s director and founder Chas Salmen started the organization, his first meetings were on a beach where he gathered ideas about what issues Mfangano Islanders felt were most important. One thing kept coming up over and over again: “We want Internet.” And so Chas focused OHR’s energies on brining Internet to Mfangano Island in a way that would help the local population. Cellular data coverage is generally good in Kenya. By “good” I mean that in urban centers you often find 3G speeds, and that slower EDGE data is fairly widespread in the countryside. Mfangano Island is an exception. It lies 50 km off the Kenyan shore of Lake Victoria, and providers have been hesitant to build towers on the island because of its remoteness and the unique challenges of making long links work over water. Instead, Islanders must rely on distant mainland cell towers, resulting in connections that continually drop out, and speeds that are slow for one user, and truly glacial when shared among multiple computers. On that initial survey, I hiked Mfangano from top to bottom with Robinson Okeyo and Brian Mattah. I conducted a standard Inveneo wireless survey: taking GPS points, pictures and notes. I learned that the highest point on the Island was considered sacred ground (and obviously an inappropriate place for an antenna) because it was where the very first man to inhabit Mfangano built his house. I saw beautiful Kenyan sunsets across rustling maize fields, with the expanse of Lake Victoria as a backdrop. The main thing I came away from our initial survey with, was a deep respect for OHR. I have never met another small NGO with as much heart as OHR. Every member of the OHR team I worked with, most born and raised on Mfangano, is committed to the success of the organization on a very personal level. OHR is primarily focused on delivering social services to the community around HIV/AIDS issues. Kenya’s Suba district has one of the highest HIV infection rates in Kenya, estimated to be between 25-30%. OHR came up with the unique idea to start the Ekialo Kiona (EK) center. 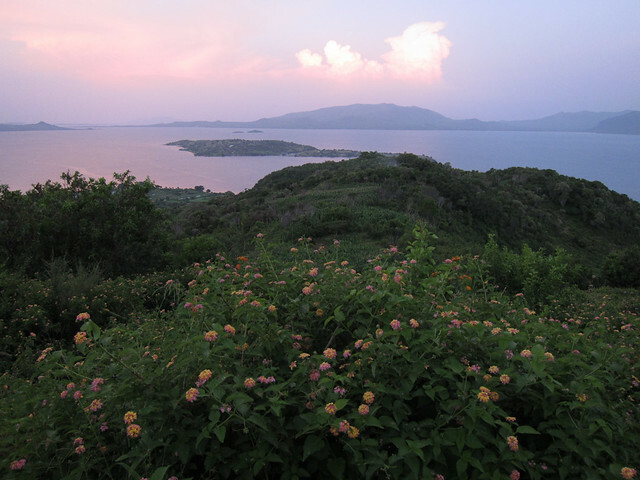 Ekialo Kiona means “Whole World” in Suba, the local language of Mfangano Island. The EK center is a well-equipped computer center, library, and training facility, and it’s free for all the residents of the island to use. The only condition for access is that users must know their HIV status, current within 6 months. The EK center runs a testing and counseling center in the building across the hall from the computer lab, and issues identity cards to all EK center members. These cards not only grant access to the EK centers resources, but also help with the process of referring HIV positive members to the right treatment and care facilities. Returning from the survey visit, I plugged the GPS points I’d captured into RadioMobile, the open source link planning software Inveneo uses to do WiFi analysis. RadioMobile uses freely available terrain data captured by the space shuttle to create a three dimensional view of the project area. It combines that with radio propagation models to let us analyze possible antenna locations for WiFi links. Based on this analysis, Inveneo came up with two options for OHR: lease space on a Kenyan cell provider’s tower on the mainland, or build their own 20m mast high on Mfangano’s Soklo Mountain, and attempt a whopping 90km link all the way back to the province capitol city of Kisumu where high speed internet is readily and affordably available. OHR, wanting to invest in small Island welders and fabricators as much as possible and to avoid the recurring costs of leasing a tower, chose the second option. OHR also found the mast construction option attractive because it would enable them to setup a community FM radio station to inform Islanders about their services. I have to admit; at the time I was skeptical of OHR’s ability to pull together a 20m mast safe enough for me or other Inveneo engineers to install equipment on, and to get it in exactly the right spot. Then again, I didn’t know OHR’s determination and work ethic as well then as I do now. With Inveneo’s advice, OHR took on negotiations for the land we’d identified as the “sweet spot” for the tower. Sorting that out involved discussions with the father who owned the land and his two sons he’d divided it between. OHR’s local buy-in was critical here, as we later found a large Kenyan cellular provider had tried and failed to negotiate a land use deal with the farmer. OHR also secured an agreement with the owner of the tallest building in Kisumu to mount a pole and dish on their roof. OHR did research and consulted with mechanical engineers to come up with a design that could be built by Island welders in 10ft sections. These sections would later be carried up the only footpath to the top of the Island, bolted together, and fitted with tight guy wires. OHR next had to learn about proper grounding of radio masts. For obvious reasons, tall metal objects on high points tend to attract lightning. Tower grounding involves building a copper cage of sorts out of multiple rings of copper wire buried at the base of the tower. A lightning rod must be mounted high on the tower, and tied into the copper cage. 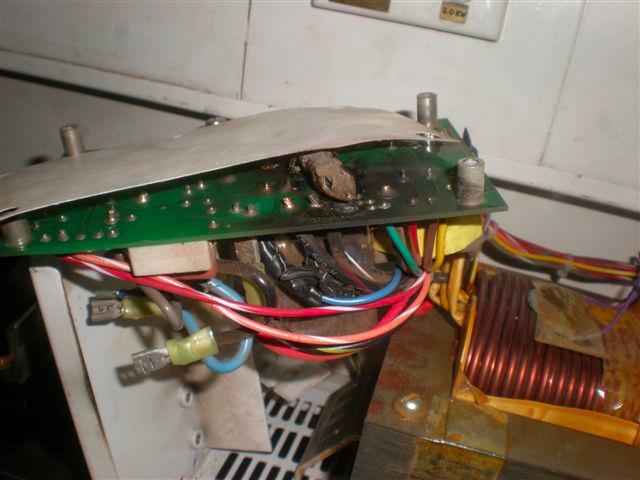 This is essential to be sure sensitive electronic equipment on the tower survives lightning strikes unharmed. The final step before construction could begin was to sort through the regulatory issues, and particularly in Kenya this is no small feat. Communications, aviation, and environmental regulatory agencies had to be contacted, forms had to be filled out, and fees had to be paid. OHR navigated all these hurdles with remote technical input from Inveneo and many others, but to keep costs down and to make sure the OHR team was intimately familiar with the details of the project, OHR local staff handled the bulk of the discussions and negations. With the tower in place, OHR just needed electricity. After all, there aren’t exactly wall sockets sprouting out of the corn fields. Mfangano Island does have a small gas burning power plant (essentially a building sized gas generator). However, distribution wires and power poles haven’t been run around the perimeter of the Island yet, let alone to the top of Soklo Mountain. Kenya Power could be paid to install the wires to the mountaintop, but install fees would be enormous, and maintenance would have been extremely challenging. 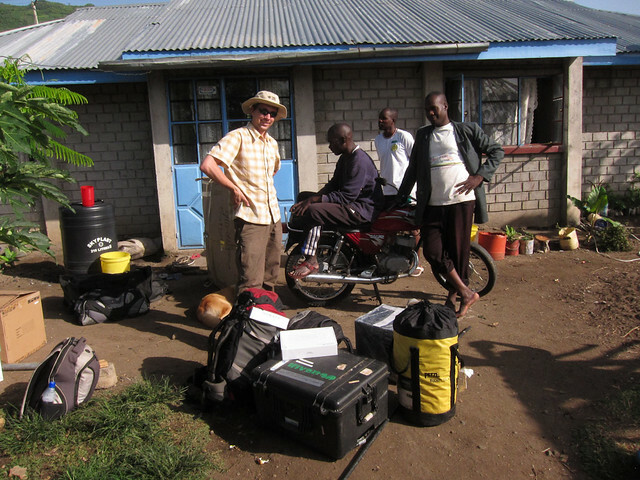 OHR enlisted the help of a Kisumu-based organization Access Energy, started by Sam Duby. Inveneo has always prioritized low power equipment, and the WiFi gear we needed to install at the tower would only require 24 watts to operate 24/7. However, FM radio transmitters are a different story and are inherently power-hungry. Access Energy built a hybrid solar/wind system consisting of a panel and two locally fabricated wind turbines. Sam’s turbine mast design uses hinged, guyed monopoles. These are far easier to put up than climbable masts because turbines can be assembled before the whole pole is tilted into place. This doesn’t work for WiFi, though, because high gain dishes must be carefully aimed by a person on the tower to ensure a strong signal. With all the prerequisites in place (tower, licensing, power), it was now time for Inveneo and our Kenyan ICIP Setright Technologies to deliver on our promise to get the WiFi link up. I definitely had a few butterflies when it came time to deploy. I knew the science was sound, but long WiFi links over water present unique challenges. Water and land heat and cool at different rates. This in turn keeps the air above at different temperatures. Every time radio waves cross a temperature boundary, they bend slightly. As the air temperature changes throughout the day, this can make the ideal antenna position for, say, 6am vastly different from the ideal position at 6pm. Talking to others, it seemed that one of the key factors was whether the ends of the link were high up (good) or very close to the edge of the water (bad). In this case we were in luck, because both ends of the Mfangano-Kisumu link were quite high above the water. Inveneo uses wireless equipment primarily from an innovative California-based company called Ubiquiti. Ubiquiti gear is rugged, easy to use, high performance, and at a far lower price point than many more traditional telco manufacturers equipment. 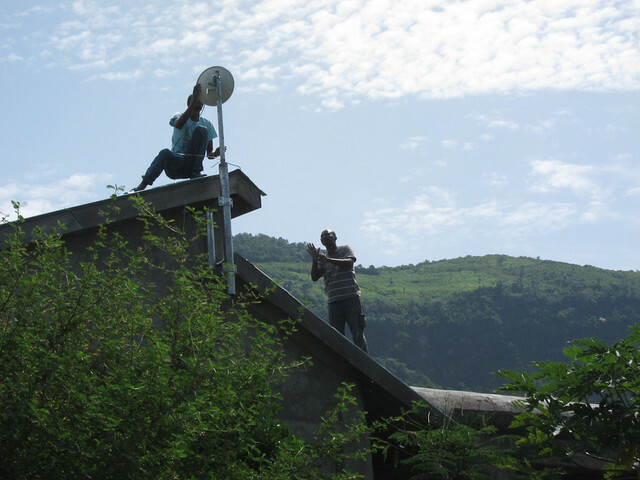 Inveneo selected Ubiquiti equipment for the Haiti Rural Broadband Network that spans 30+ towers across virtually the whole country of Haiti. For the OHR project, we chose Ubiquiti’s RocketM5 radio paired with their largest dish: the .9 meter, 34 dBi RocketDish. We fitted the dish with a radome: an aerodynamic cover that turns it from a wind-catching scoop into a smooth bubble. This change in wind resistance literally cuts the wind loading on the tower in half: a critical factor when putting such a large dish at the top of a skinny-guyed mast. I’ve come to realize recently that something like 85% of implementing ICT projects in developing countries is proper logistics. The technical work itself isn’t all that challenging, but if you get to a place like Mfangano and find you don’t have the proper tool or spare piece of gear, you can quickly find yourself in a non-workable situation. Once the equipment arrived in Nairobi, Setright shipped it to Kisumu. 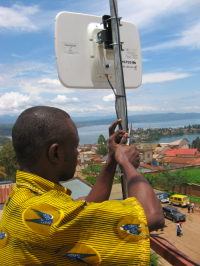 Sam Perales, one of Inveneo’s Project Engineers, and I traveled to Kisumu in late May this year to install the link. 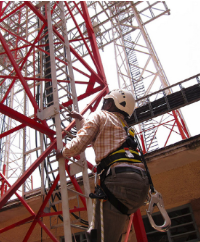 The plan was for Sam to remain at the Kisumu end of the link, managing the team installing the dish on top of the 18-story Province Headquarters building. Inveneo has learned from experience that with any link over about 40km, it’s key to have teams at both ends simultaneously to fine-tune the aiming. We found once we arrived in Kisumu that the 18 story building had never been fitted with elevators, so Sam’s team had to carry hefty pelican cases and the large dish up 18 flights of stairs. Sorry Sam! I can honestly say Mfangano is one of the most remote places I’ve ever been. To reach Mfangano Island from Kisumu, I traveled by SUV to Luanda Kotieno, and from there by small car ferry to a spit of land called Mbita. The last hour from Mbita to Mfangano is done by wooden fishing boat. For the final two hours to the top of Soklo Mountain, travel by foot up the rugged footpath through the jungle is the only option. It’s a journey that’s challenging without a few hundred pounds of tools and equipment. Adding that in it makes for hot, sweaty work. OHR rounded up a group of 6 strong guys to help us get the gear up to the tower. I can only imagine what it was like to carry the even heavier tower sections up there. OHR’s project coordinator, Robinson, was a whirlwind of activity as he arranged all aspects of moving the equipment. His rapid fire approach has earned him the nickname “Marucha” (speedy, in the Luo local language) and it’s certainly an apt moniker. With myself, Edwin (an engineer from Setright), the OHR team, and all the right equipment finally at the base of the tower, it was time to get to work. From our time in Haiti, and our recent month long deployment of a medical records network for AMPATH (also in Kenya, further north) we’ve got this part of wireless installation down pat, and the work flows smoothly. We have beautiful sunny weather and a cool lake breeze that’s pleasant up on top of the tower. Through our partnership with the tower safety experts Petzl, Inveneo has learned a few tricks for rigging hauling systems that makes the task of getting a heavy dish to the top of the tower easier so that went like clockwork. Through Petzl’s generous support, we were also able to donate a climbing safety kit to OHR and train them on its use. This will enable the OHR team to safely carry out any necessary repairs or replacements. The physical part of the install (hoisting the gear, bolting it to the tower, running the cable, and so on) is by far the most time consuming aspect of wireless work. This, and dealing with a few unexpected wrinkles involving malfunctioning power inverters and poles that were too short to hold our dish, took the whole first day. OHR has two jovial guys assigned to their “emergency team.” The emergency team is the fix-all troubleshooters. In this case, the emergency team was tasked with carrying up a spare inverter and a backup generator from the base of the Island. “Spare” isn’t actually quite the right word. I learned later that the inverter they sent up came straight from OHR founder Chas Salmen’s personal tent, so Chas and his partner, OHR’s Agriculture Coordinator Jenna, would be without power at night until the permanent replacement could be arranged. Thanks Chas and Jenna! With day one complete, we headed back down the trail at 6pm finishing the steep hike by headlamp-light. I was excited to know that the following day would be the moment of truth when we would light up the link back to Kisumu and finally see what kind of performance we’d be able to deliver. The second day’s hike was harder than the first, largely due to sore muscles from the day before. Edwin had the bad luck of having bought new shoes just before the trip and was fighting blisters. Fortunately, we’d been able to leave the gear in the small shed at the base of the tower so we were less encumbered at least. Edwin manned the laptop in the equipment shed, communicating with me on the tower with our Motorola VHF radios. We picked these up for our Haiti work because they’re the standard that tie in with the UN’s radio networks around the world, and they’d come in handy recently on our Dadaab deployment. Amazingly, I was also able to reach Sam in Kisumu 90 km away on the VHF radio. This proved extremely helpful as I could coordinate with both Edwin and Sam in realtime. We powered up the Ubiquiti radios, got them to connect to each other almost right away, and did a little fine-tuning. This is a painstaking process that takes a lot of patience. It involves the engineer at the base of the tower reading out signal strength numbers as the man on the tower makes minute adjustments to the dish. It’s proven one of the hardest skills to pass on to our partners, and the amount of precision required goes up as the link distance increases. On the OHR project, aiming went very smoothly since Edwin mastered the skill. I called down from the tower to ask Edwin what final signal strength we’d settled on once everything was locked in. When the answer came back “-52 dBm” I could hardly believe it, and had to ask him to repeat himself. dBm is a measure of received signal strength. The less negative the number the better the signal. I’d been expecting something in the mid-70s or so, and to hear -52 was incredible. That was the moment when we knew for sure that we’d have a stable, high-bandwidth link to the island, and it was hugely gratifying. After coming down the tower, we finished the equipment room installation, did final configuration of the router and monitoring server, and tidied things up. The monitoring server is an important part of any wireless network, as it lets you look at statistics on performance of the network captured around the clock. A few final tweaks to the router configurations were all it took to “switch on” the Internet link. The first thing I did to test the connection end-to-end was Google “Mfangano Island” and up popped a very responsive Google map. Robinson and Brian were impressed with how fast it updated as I zoomed in and out, switching on high-resolution satellite photos of the island. Getting ready to leave a remote site for the last time is always a little nerve-wracking. You find yourself double and triple checking cables and connections, because you know leaving something unplugged would mean another long hike up to fix it. We again hiked down by headlamp, feeling a strong sense of satisfaction knowing the hardest work was out of the way. Edwin and I spent our final day on the Island installing the EK center end of the short wireless link to the tower. It’s the EK center where all the computers are and where the Internet bandwidth actually reaches the end-users. Fortunately we’d done our job right at the tower, and the link came right up when we pointed the small Ubiquiti NanoBridge up at Soklo Mountain tower. Edwin ran the installation, and things went smoothly. We also installed a local wireless access point (a Ubiquiti NanoStationM2) in the EK center to make sure laptops throughout the small campus could benefit from the internet). When I fired up a speed test site on one of the EK center computers and measured a blistering fast 8Mbps, the eyes of all 6 people watching over my shoulder went wide. This is truly one of my favorite moments of a wireless installation: when the high-speed bandwidth reaches the end users for the first time. Word traveled fast, and the EK center’s 10 computers were quickly full. I saw a lot of gMail, some Skype, a bit of Wikipedia, and some Google image searches in just the first 10 minutes. After putting the finishing touches on the EK center installation, Edwin and I spent a few hours training Brian on the layout and maintenance of the network. We made sure pre-configured spares were handed off and hung a detailed diagram of the network to help with troubleshooting. Climbing into the fishing boat and speeding away from the Island, I looked up at the Soklo Mountain tower. The large white dish glinted in the orange evening sun, clearly visible from a few km away. I talk a bit with Edwin about all the hard work over two years that AccessEnergy, Inveneo, SetRight, and especially by OHR invested in making that tower a reality…and we both smile. I’m excited to see where OHR takes this project next. Sometimes the greatest advocates for Inveneo’s work emerge from the most unlikely of places: retirement! Much like our own Bob Marsh, a personal computing pioneer dating back to his days with the Homebrew Computer Club in Silicon Valley, other veteran technologists have recognized the vision and efforts behind Inveneo’s work in getting the tools of ICTs to those who need it most in rural and underserved areas across the world. Our most recent supporters come from the ICT networking field. The Internet Society (ISOC) presented its 2009 Jonathan B Postel Service Award to CSNET, recognizing the groundbreaking work of the Computer Science Network, the research effort in the early 1980s that laid the groundwork for what became today’s Internet. The four founders of CSNET – Peter J. Denning, David Farber, Anthony C. Hearn and Lawrence Landweber – were collectively lauded for having made outstanding contributions in service to the data communications community. Unanimously, the four award winners chose to donate the proceeds of their award to another deserving community – Kendu Bay, Kenya. Known primarily for being the birthplace of President Obama’s father, Kendu Bay is a small town at the center of an underserved community in Western Kenya. With the $20,000 in funding from the Postel Service Award, Inveneo has implemented the Jonathan B. Postel Technical Academy. Run by local organization Rachuonyo Online Networks, the Technical Academy will be co-located with a Cisco Networking Academy, offering a multitude of learning and training opportunities for participants of varying levels of technical expertise. You too can join Bob Marsh, the CSNET founders, and other technology luminaries in supporting Inveneo’s efforts around the world. Making technology work in the rural and developing world is a process full of unique challenges. I am Andris Bjornson, Inveneo’s Chief Technology Officer and practicing project engineer. As an Inveneo engineer, I have to be prepared for it all. Recently in Kenya’s Masai Mara Game Preserve, I had what I’d call in rock climbing terms an “epic” day traveling to bring the Cisco Community Knowledge Center (CKC) in Sekenani, Kenya (photos) online with high speed terrestrial broadband Internet. This is not by far the most difficult deployment (that would be 3 weeks in Nepal dealing with monsoon rains and leeches) nor the most chaotic (probably our Haiti Earthquake disaster response) However, the condensed timeline, wild game, and bad weather combined to make this a good story. 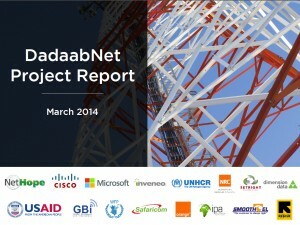 I had arrived in Nairobi after finishing a week-long wireless connectivity assessment in the UNHCR Dadaab refugee camp and I was asked to tack on an additional day of work for this special project, to make the final adjustments to bring the connection live. 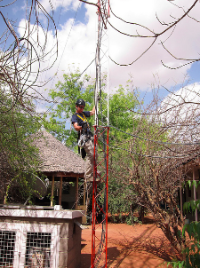 This was the first time in Kenya that we would be connecting one of the CKC’s with broadband Internet by partnering with a local carrier at their tower and then using long distance wireless (WiFi) to connect to the CKC facility 20 kilometers away. It was supposed to be a quick in-and-out flight into the Masai Mara Game Preserve, as the CKC is just inside one of the Park’s eastern gates. We usually send one of our Inveneo Certified IT Partners (ICIPs) to complete a technical installation like this. All of the equipment had already been put in place, but the connection had to be tested and completed now that the CKC had signed the service contract. First-time installations are always tricky. 6:00am – Wake up in my hotel in Nairobi, scarf down a quick breakfast and call Bernard, a friendly taxi driver I had met earlier for a ride to Nairobi Wilson airport. This small airport is Nairobi’s jumping off point for all domestic, tiny aircraft that would generally worry my mother. 8:15am – Arrive at Wilson after navigating Nairobi’s legendary traffic and check in at the last possible minute. 9:15am – Take off in a Twin Otter: the favorite 20 seat, twin-prop workhorse of rural airlines from Nepal to Borneo. 10:30am – Land at the dirt airstrip at Keekorok in Masai Mara. Connect with Tony, the friendly Land Cruiser driver and guide whom I’ve hired to take me where I need to go. The change from UN convoys with armed escorts in Dadaab to convoys of open top matatus (vans) full of tourists seeking sightings of the “big five” (elephant, lion, leopard, black rhino, and water buffalo) is jarring. 10:50am – While bouncing down the dirt track to my destination, I see a herd of elephants! (Never seen them in the wild before.) Check in with the cellular engineers I’m scheduled to meet. Our wireless equipment, which serves the CKC with Internet, is co-located at their Talek Market cellular tower, and I’m supposed to meet them at the project site. I learn that, though I’d made them promise to meet me at their tower by noon when I spoke to them last night, noon had become 1pm by the time I talked to them from Nairobi in the morning, and now it’s going to be 2pm due to car trouble. This is not uncommon, though given that my return flight leaves the airstrip at 4:15pm and the airstrip is at least 30 minutes from the tower, it is less than ideal. I need to connect with an international flight the same day in Nairobi, and this is the last flight out of Masai Mara for the day. I hope furiously that an hour and a half onsite will be enough. 11:10am – Arrive at the Sekanani CKC,the site I’ve come to connect. I meet with Kerry and Musa, the CKC managers, and discuss the problems. Initial diagnosis shows that what we’d thought was the cause of their Internet troubles is actually several completely unrelated problems. The Inveneo R3 server’s BIOS (the most basic “brains” of a computer) has reset itself and lost its settings, which can sometimes happen due to unusual power conditions. I fix this and show Kerry and Musa how to fix it if it happens again. One of the server’s two mirrored hard drives has also failed (not uncommon in hot, humid and dusty environments. Sekanani is all three). Fortunately, our Inveneo R3 server has RAID: a technology that allows the server to keep running even with one failed drive. 12:30pm – Learn from Tony the driver that the normal road from Sekanani to Talek Market (the cell tower location) is deep under water from recent heavy rains. This turns a 15-minute drive into a 40-minute one. I pass this information on to the cellular engineers, who are still en route. 1:00pm – Quick lunch, then head toward the cell tower with Tony. 1:50pm – Herds of Antelope cross the road in front of us as we drive. 2:10pm – We arrive at the Talek Market tower, and find that the cellular engineers have just arrived! 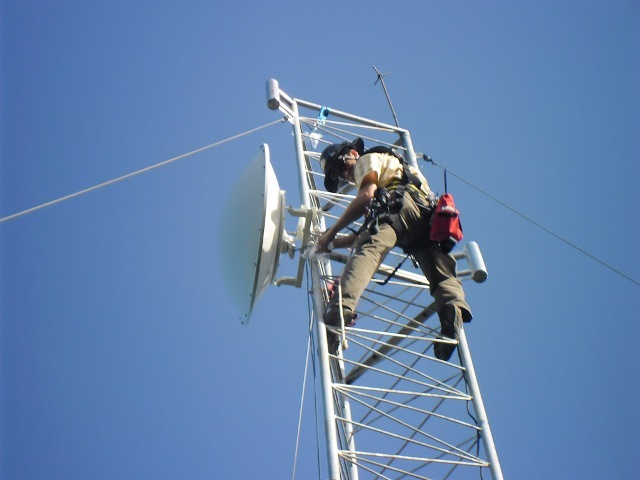 I eye our equipment at the very top of the 40m tower (a Ubiquiti NanoBridgeM5-25) and think how lucky our engineer, Jen, was to have installed it during the great migration season. She has pictures of massive herds of animals passing under her. 2:15pm – I discover that, three weeks earlier, the cellular provider moved our equipment and wiring to a completely new cabinet without letting us know. The way the move was done seems to have caused a power spike that wiped our long- distance WiFi radio’s settings. It’s a problem we knew about, but one we discovered after the equipment installation had been performed three months prior. 3:15pm – I reconfigure the radio from scratch, grateful I don’t need to climb the tower, and bring the link between the tower and the CKC back up and functioning again! Check in with the cellular providers’ NOC (network operations center) to verify connectivity. They confirm the test passes! This is good, because it has started raining and I’m running out of time. Upgrade firmware: the link to the CKC goes down! I’m out of time, it’s continuing to rain, and given the results of the NOC’s test, I theorize that I can fix the remaining issue remotely from Nairobi. 3:35pm – See some zebra hanging out by the side of the road. They don’t seem to mind the rain. 3:40pm – I receive a call from the NOC that their test has, in fact, failed. This problem will make it impossible to access the equipment remotely. Wish they would have told me this before I left the site, but I’m impressed with their follow-through. Better to find out now than after leaving the country. 3:45pm – We make the judgment call to push my return flight to Nairobi and my onward flight to San Francisco back by a day to finish the work. Spend 15 minutes on hold with the travel agent’s emergency line in an effort to get them to change the international flight. The international call burns through my remaining cellular credit and I never do reach them. Tony is also out of phone credits so I can’t even call Air Kenya to cancel my domestic flight. 4:05pm – Continue to the airstrip to tell the Air Kenya pilot that I can’t take his flight back to Nairobi. Buy cellular credit from a driver at the airstrip, call Air Kenya, and learn that the 4:15pm flight tomorrow is full. The best they can do is 10:15am tomorrow. Hope that buys me enough time to finish the work. Head back to the CKC to see what I can do from there because it’s much closer than the tower. 4:35pm – We reach the CKC. I tweak some WiFi link settings. This fixes part of the remaining problem but not all of it. Then I have the “a-ha” moment realizing what happened during the firmware upgrade at the tower and that I need to go back. 5:15pm – Head back to the cellular tower (again, the long way because the fast road is washed out). It’s raining really hard now. 5:55pm – Exit the Masai Mara Park gates (the tower is just outside the park) and beg the ranger to let us back in in 20 minutes (15 minutes after closing time). Hope that I can fix the problem in 20 minutes. Pull on my raincoat, and grab my laptop. 6:05pm – Find myself hunched over my laptop, plugged into equipment inside a cellular equipment cabinet with two guards and a driver holding golf umbrellas over me to avoid drenching at least a hundred thousand dollars worth of cellular equipment and bringing down cellular service in the immediate area (our WiFi gear is housed in the same cabinet). Laugh at the absurdity of the situation. 6:10pm – Fix the problem while keeping surprisingly dry. I’m annoyed at myself that it was partly a stupid mistake on my part and partly a known bug I should have remembered, that causes a critical checkbox to check itself when firmware is upgraded to this particular version. Make a mental note to tell our teams in Haiti about this bug. 6:15pm – Call Kerry at the CKC. Still under the golf umbrellas in the deluge (though thankfully we’ve closed the cellular cabinet), talk him through some technical troubleshooting steps to verify that everything is working from his end. Hooray! 6:16pm – We all have to walk through ankle-deep water to get back to the car. The land around the tower has turned into a lake. Feet are soaked and muddy all around. Pass the tower guards some Kenyan Shillings for going way above and beyond the call of duty and helping me (and much more importantly, the equipment) keep out of the rain. 6:20pm – Start the trip back to the CKC, grateful that the Masai Mara ranger honors his promise to let us through the gate slightly after hours. 6:45pm – Spot some ostriches: cool! 6:50pm – Glad to reach my colleague who is passing through Nairobi for some meetings. He has good Skype access and makes the international call to change my flight. Change fees are totally reasonable! Phew. 7:00pm – Glad that Tony is a flexible guy, arrive at the CKC. This is way more driving than he bargained for. Do some general IT housekeeping, verify that the link is performing well. 7:20pm – It’s well after dark now. Needing to use the restroom, I stumble off with my flashlight to find the outhouse. Kerry warns me to watch out for hyenas. He is not joking. 7:30pm – Shake hands with Kerry and Musa, glad that everyone’s hard work paid off and that the CKC now has a 2Mbps symmetric Internet connection. This might not sound like much in San Francisco… but this is by far the fastest, most affordable Internet available out here in the bush. 8:00pm – Return to the safari camp where I had lunch and explain that, yes, I was supposed to have left already but please do they have room for me. Fortunately, they do. 8:15pm – Grateful to change into some dry clothes. Finally unwrap the soaked ace bandage from my swollen ankle (I sprained it a week before jumping on a trampoline with my wife). Relaxing at this amazing spot is a fantastic reward for an exhausting day of work. 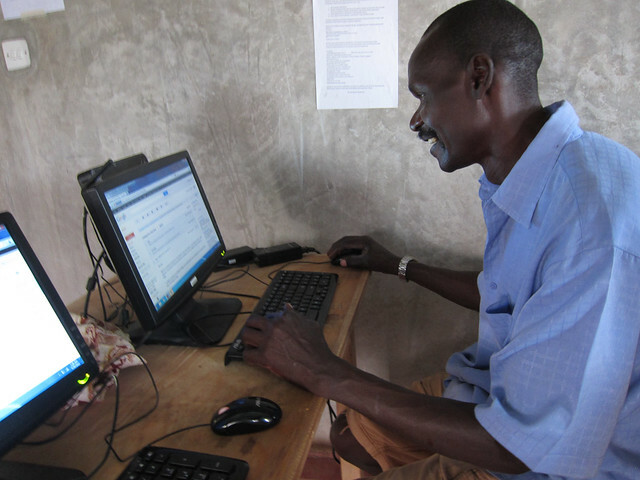 It all feels worthwhile because the CKC has Internet now and can greatly expand their (ICT) services to the community. In places where Internet access is hard to come by but computer viruses spread like wildfire, protecting a single PC or an entire computer lab is a huge challenge. When files are shared between friends and colleagues, so is malware. This is not necessarily a problem if the user has taken proper measures against viruses and other types of malicious programs. However, in the developing world many computer owners are either unable or unwilling to purchasegood anti-virus/anti-spyware software, and even with the proper software installed, limited Internet access means less frequent download of the critical updates. Without these updates, anti-virus and anti-spyware software are essentially useless. To mitigate this problem, Inveneo has adopted the Faronics DeepFreeze software. DeepFreeze is a software program that creates a “frozen” snapshot of a workstation’s configuration and settings. It can freeze entire drives or select files, allowing a computer to boot to a pristine Operating System every single time. Viruses can be malicious, disrupting the current session, modifying the registry, destroying user content, but when the system is restarted the effects of the virus or malware are wiped away. This is the only solution that Inveneo has found to be bulletproof in low resource settings, keeping the computers up and running over an extended period of time. The Cisco Community Knowledge Centers (CKCs), scattered in eleven locations across Kenya and Ethiopia, are a great real-world example of Inveneo desktop installations utilizing DeepFreeze. The CKCs are community centers, places where locals from a village or region can gather to learn, explore the Internet, print or copy documents and socialize through events like movie nights. Even after two years, the CKC computers are still up and running with little to no maintenance from Inveneo or our local partners. This is a huge accomplishment considering the harsh environment and number of infected external media constantly cycling through the centers, all a testimony to the effectiveness of DeepFreeze. Choose which drive(s) to freeze. Further, the administrator can take a more granular approach, freezing/thawing only specific directories and files. Create up to eight thaw spaces, leaving frequently updated program files or system files thawed. Schedule a maintenance window so the system will reboot thawed for a specific time period, possibly synched with automatic system maintenance. Specify a WSUS (Windows Software Update Server) and batch file for scheduled maintenance period. Create embedded events schedules, like scheduling the system to reboot everyday at a specific time. Configure network settings, security options, and administer License Keys. There are many other more advanced options available with the Administrator Console. Examples include pushing configurations and installations from a centrally located or remote console. We are grateful for the generous donation that Faronics has made to our efforts in Haiti, contributing complimentary licenses for use in the 40 rural schools participating in the “Haiti Connected Schools” program. This contribution is already making a great impact on the sustainability and longevity of the technology Inveneo is deploying, ensuring use by deserving Haitian schoolchildren for years to come. 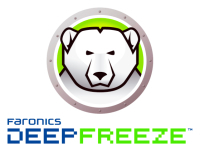 For more information on DeepFreeze, please see the Faronics DeepFreeze Enterprise product page. From there you can see more product details, screenshots, read user reviews, and download user guide/tutorials. Over the past 6 years, Inveneo and its 68 Inveneo Certified ICT Partners (ICIPs) have delivered innovative solutions and brought access to impactful ICTs to more than 1,700,000 people in over 700 communities in Haiti and 25 countries in Sub-Saharan Africa and South Asia. Along the way, we’ve found that appropriate technology and human constraints are the greatest limitations in integrating ICTs to improve social and economic development. ICT solutions need to be specifically designed for challenging environments and must be managed by local organizations with rural ICT expertise for ongoing support and expansion of these systems. 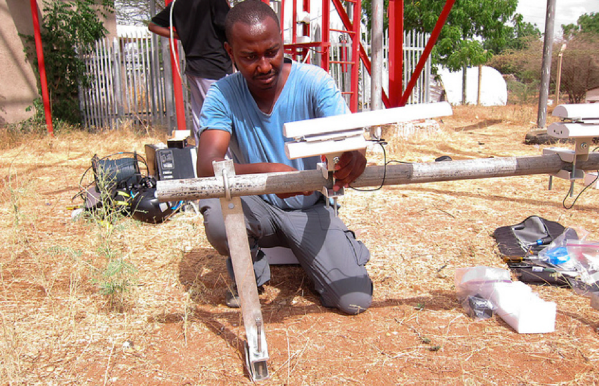 Expensive Electricity: Rural and other underserved locations rarely have a reliable electrical power infrastructure that can support a standard ICT implementation. Traditional computing systems are therefore cost-prohibitive because they require so much electricity – upwards of 200 watts per computer – when solar installations average $12 per watt. High Heat and Dust: Traditional computers, designed for use in air-conditioned office spaces, can fail when ambient air temperatures reach 38°C or 100°F in dusty settings. Under these conditions a computer can become useless if replacement parts are not available. Computer Viruses: Computer viruses are particularly problematic for underserved communities – the lack of connectivity and access to regular virus software updates often renders anti-virus protection useless over time. Lack of Connectivity: Local Internet Service Providers (ISPs) generally do not offer connectivity in the remote areas where we work and mobile phone data networks often have limited reach and can be prohibitively expensive. Inexperienced Users: Because they’ve not had access to ICT, inexperienced users often make simple mistakes that can render computers unusable. Distant Tech Support: All the previous challenges with ICT implementations in underserved communities are compounded by the lack of local capacity to provide technology support and maintenance. Without knowledgeable tech support, any mistake or user error can destroy a system, depriving the community of ICT’s benefits. Yet communities often do not have the means to keep qualified technicians in their midst. Local capacity building through partner networks of in-country ICT experts who can deliver the installation and ongoing support that is critical for the long-term sustainability of technology projects. Inveneo’s solutions have real impact with organizations that deliver vital education, healthcare, economic development and relief services to some of the poorest communities in the world. We enable these organizations – NGOs, governments and others – to more effectively serve people in need through technology. 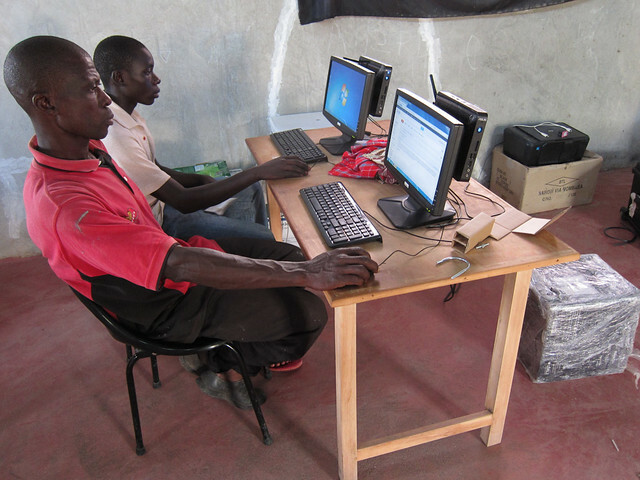 We’ve created sustainable community knowledge centers in Kenya accelerated microfinance institutions in Sierra Leone, and brought access to life-changing ICTs in Haiti.